Lights, camera, action! Discover the actress within as you take part in an all-camp musical production. Perform, help with costumes, or sing one of the parts. The dance program is a great way to be creative. Learn new dances and styles, figure out a whole dance routine, or just enjoy some free form dancing. Time to bring out the costumes! 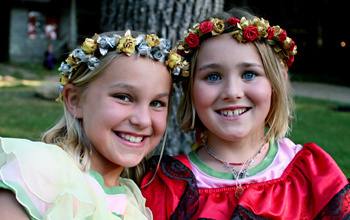 In the evening, you’ll be dressing up for skits in your age group lodge, or getting ready for an all-camp evening program. 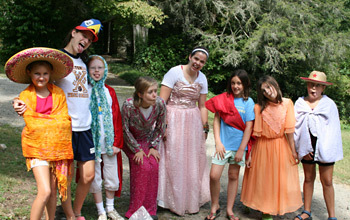 Rockbrook provides campers with creative outlets including Drama, Dance and Creative Writing. These girls camps programs inspire campers to be themselves, use their imaginations and express their individuality each day. From improvisational games to writing and directing one-act plays, the Drama activity offers an opportunity for constant amusement, originality and fun. 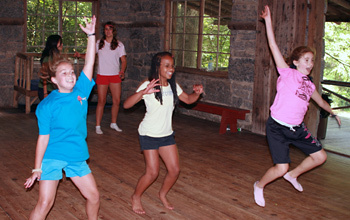 Girls camps are always full of singing, and Rockbrook is no exception. Each summer session, campers are given the opportunity to participate in our all-camp musical as well as our daily dose of good ole girls camps songs. In Dance class, instructors teach routines ranging in style from modern dance to country line dancing. 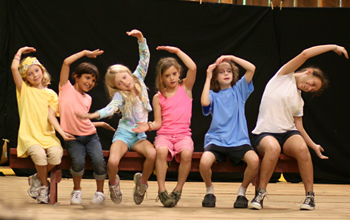 The classes perform their routines during the intermission of the Camp Musical. Another way campers can explore their creativity is on paper in Creative Writing and Journalism class. Campers can publish their works in the camp newspaper or in the holiday yearbook called the Carrier Pigeon. We wouldn’t be like other girls camps if we didn’t give our campers the opportunity to show off their range of talents. Learn more about Rockbrook’s Dance and Drama programs.